A big wedding was certainly not for us. As a couple who loves to travel we were more concerned about the honeymoon. 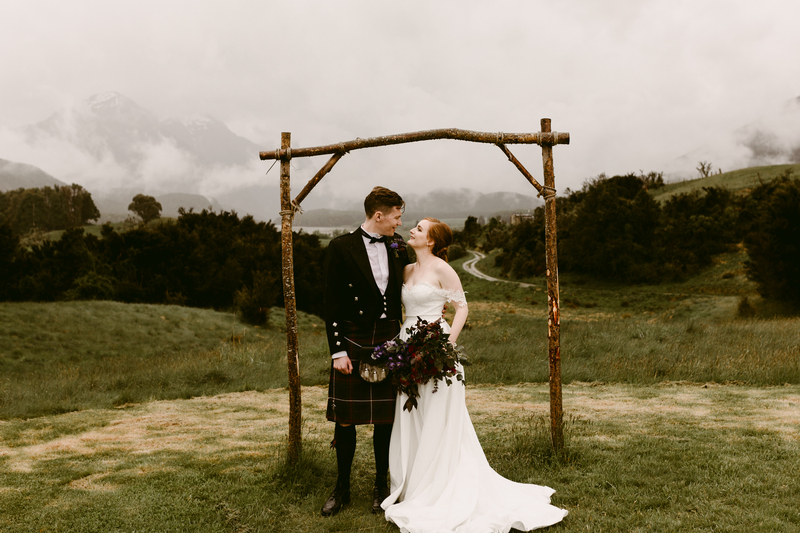 However, this did not stop us from having a magical elopement with our nearest and dearest in Glenorchy, New Zealand. On Friday 16 November 2018 we got married. It was a low stress day and we had our wedding in one of the most beautiful places in New Zealand – Paradise Trust. When we were planning our wedding we were looking at big venues to have all our friends and family attend. When a decision had to be made to book in the big wedding it just didn’t feel right. We then searched eloping in New Zealand and found – Hitched in Paradise. It seemed too good to be true, a wedding in a beautiful location in the mountains, a wedding planner that organised it all and a Helicopter! In the end it was an easy decision and we booked it. We only invited 15 guests which made the whole experience very intimate and as both of our families are from different sides of the world (Scotland and NZ) so it was a great chance to all come together and get to know one another. Initially I think our families were disappointed we were having such a small wedding. Over time I understood a wedding is a big deal for parents as well as the bride and groom. It is a milestone in their lives which both of us grew to appreciate. We have not regretted even for a minute having a smaller wedding. We selected our elopement package from Hitched in Paradises website and worked with Susan for around 9 months to create our day. We planned it with Susan all via email conversations and she was able to customize parts of the package to our needs. As vegetarians we catered the wedding 100% vegetarian. This was a great way to show off the delicious foods available to us. We also had an amazing passion-fruit and white chocolate cake and got to bring our own wine and beer which allowed us to showcase some of New Zealand’s best wines… We know the wine was a hit as 17 bottles between 17 people were enjoyed over the course of the wedding. The flowers by Orange Blossom Designs were also included and organised in the package, all we gave them was a picture of Alisdair’s kilt as a colour guide. The flowers were so beautiful, I couldn’t have come up with something so amazing so I am glad I trusted the experts. Alsot peonies were in season which was a bonus. It rained on our wedding day which initially disappointed us as we couldn’t have our ceremony outside, however, the rain was magical and in the end we loved it. The mountains were covered in mist which created a romantic setting. We had fires lit in the accommodation cabins and the small hall where we hosted the ceremony and reception. Our wedding planner Susan from Hitched in Paradise sorted everything from decorating the indoor venue to umbrellas, so we didn’t have to worry about a thing. All we had to do was turn up and enjoy our ceremony and party. We had our ceremony at 5pm which removed stress and we all partied into the night. Due to the rain the helicopter included in our wedding package was postponed until the next day. This meant we got to dress up 2x which was fun as wedding dresses are expensive. It was so exciting taking off over the mountain ranges and landing on top of an isolated mountain. We absorbed the views and and a fun photo shoot with our lovely photographer Dawn, who kindly agreed to come back the next day for another round of wedding pictures. Paradise Trust is about an hour from Queenstown, New Zealand. There is no cellphone coverage or internet. We all stayed onsite for 2 nights and enjoyed this majestic valley. Most of our family and friends stayed in the old homesteads onsite which provided a historical setting and comfortable rooms. We decided to stay in the old school. It was very romantic with only a bed, fireplace and 2x armchairs. There was also no electricity and only the outside long drop toilet… Very rustic. We were however, surrounded by the forest and views of the mountains. We will be returning for anniversaries in the future and would recommend a visit to this magical valley for any tourist visiting the South Island of New Zealand. We organised our own music (Spotify and a bagpiper for the ceremony), hair and make-up, travel, wedding clothes, rings and drinks. We found the whole experience low stress, fun, beautiful and worth every cent. With a “cheaper” wedding than a standard large function we were able to book in a dream Honeymoon in Africa!! Watch this space for our post on Tanzania!